This is timely information for us as we recently had a situation in which a woman arrived (she had not notified us that she had a large service dog). Fortunately, our cottage (which is pet friendly) was available and we put the guests in the cottage. My issue is that I'm allergic to dogs and I cannot have them in the main house. It's a difficult situation for us because we understand the ADA regulations, but at the same time I have my own health issues. Thanks for sharing this information. We have a guest that has no apparent disabilities and is with her spouse. What prevents a guest from saying they have a service dog when it is not and they just want to bring their dog along claiming it's a service dog? This is the same thing where people use handicapped parking spaces and tags when it's another person who has the disability and not them. 1. Is the dog required for a disability. 2. What service does the dog perform? I also note that the dog can not be left unattended in the room while they are out and about for the day. I had one woman, who was going to a long workshop, but didn't want to take the dog with her. I indicated that the assumption is that if the dog is needed for a disability, that the dog will go with the guest and not be left alone for long periods of time in a guestroom. We, as well, are B&B owners and JUST ran into this situation this past weekend. It seems as though upon checking into our Inn the dog owners did have papers. As I was unaware what questions to ask upon their reservation, which they so kindly informed me AFTER they made their reservation that they had a 'service dog', I of course accepted their reservation, though, reluctantly. At their reservation, I was taken aback, thus knew not that I COULD ask a couple of questions. Since I did not, I believe that they brought the dog in under less than admirable circumstance. With this, I was unaware of the ADA revised regulations until I pulled upon Inn Caring's website. Yes! This is good. This is VERY GOOD! Thank you, Inn Caring, for your most valuable information!! What I did learn is that I do not have to accept just 'any animal' in my Inn, even under the guise of a service animal. I learned that I am 'ALLOWED' to ask these 2 pertinent questions.....1) Is your animal required because of a disability; and 2) What work or task has the animal been trained to perform? NOTE, and very important...With the return our Soldiers from war, the ADA still stands, as follows: Under the ADA, "comfort", "therapy" or "emotional support animals" DO NOT MEET THE DEFINITION OF A SERVICE ANIMAL. As we absolutely LOVE our Service men and women, and offer them a 15% discount for any stay while on Leave, we unfortunately can not accommodate their dog. Again, very valuable information for those of wishing to serve our guests. Hebrews 13:2...We entertain Angel's unaware! If a veteran has a service dog because of PTSD that is in fact a Service Dog. Not a comfort, emotional support or therapy animal. I know it may seem confusing with all the different terms. Thank you Becky Sullivan! Although Service Dogs do provide comfort for Veterans, they do much much more than that! To deny a Veteran with a Service Dog is, as far as I'm concerned, nothing less than vile. These men and women have done so much for our country and our freedoms and way of life, they deserve the utmost respect and honor. And please remember that not all disabilities are visible! No "papers" are necessary. I do have a letter from my specialist but this is ONLY for use, in court. 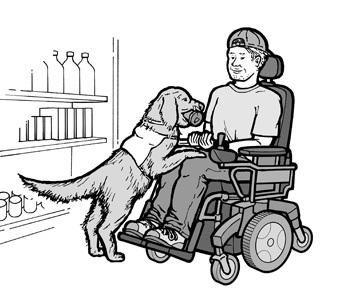 Service Dogs do NOT need to wear any special vest or other paraphernalia. You CANNOT discriminate against a person using a Service Dog - such as insisting that they only use a special pet friendly room. You cannot charge a fee for a Service Dog. Yes, if the dog should damage property (such as chewing furniture or soiling flooring) you can charge for the repairs. You cannot turn away a person with a Service Dog because they did not tell you about the dog in advance. Yes, there will always be people who try to "use" the system, but I feel that they are few and far between. There is a lot that goes into being a Service Dog Team - it's almost like having a baby with me for 7 - 10 years at a time. I love my dog but would love it more if I truly didn't NEED him! No kidding. We had one couple say they had to bring in their "service dog" since the girlfriend had extreme anxiety. They left the dog in their room, went to a Red Rocks concert with 10,000 people without the dog. THe dog ran around the room barking for 3 hours. Obviously not a service dog. Then they write a bad review about us. So sad. My B&B is my home and shared with my cat. He has a history of attacking dogs. There's no way that I could allow a dog on the premises. What about that? When there are conflicting disability needs, according to the ADA, they'd have to both be accommodated. It's also a federal offense to interfere with a service dog. So, you would have to control your cat. A business has to accommodate people with disabilities. It's just part of having a business. That means service dogs, any business has to figure out how to manage it. What are the B&B owners rights in the event they have an allergy or other health issue around animals? It wasn't addressed here. Thanks. What are the B&B owner's rights if they have an allergy or health issue. It didn't seem to be addressed here. Thanks. I have a terminal lung disease. We do not have any animals because of my condition and breathing problems. I have 4 rooms at my home/ B & B/. I do the cleaning etc. I have to be VERY CAREFUL...my life depends on it. There is no treatment, med or cure for my disease. If I have a major exacerbation I can die. What am I supposed to do? It has recently come to my attention, that if you are under 5 rooms and live on the premises, the ADA rules do not apply. However, just to be sure, I would check with someone in your city regarding your situation. There is just so much conflicting information out there. The ADA might say you are exempt, but your city or state may not. Thank you AnonymousDecember 29, 2015 at 11:26 PM - that was beautifully put! My husband is legally blind and we now travel with a service dog. We love the dog like he is part of the family, but would love it way more if we didn't have to have one at all! We do try to contact any establishment that we are staying at and inform them that we travel with a service animal, but not every one out there is knowledgeable about the rules concerning service animals.